TAMPA, Fla. – The Red Bull KTM Factory Racing Team prevailed through a challenging eighth round of the AMA Supercross Championship on Saturday as both 450SX riders finished inside the top-five amidst a chaotic day of racing. 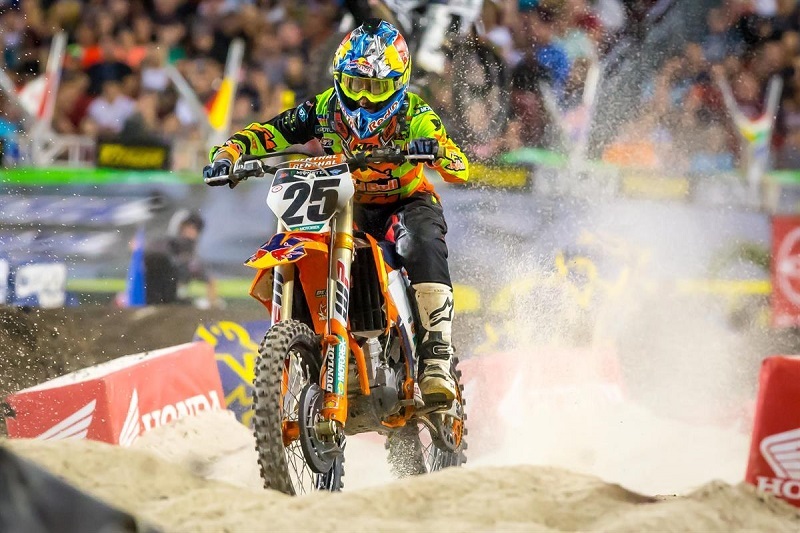 Musquin led nearly half of the Main Event before finishing 2nd on the night, while his teammate, Broc Tickle, matched his best finish of the season with 5th place in Tampa, Florida. In 450SX Heat 1, KTM riders Blake Baggett and Musquin put their KTM 450 SX-F FACTORY EDITION machines into the front of the pack off the start, with Baggett at the helm early on. However, the Rocky Mountain ATV*MC – WPS – KTM rider lost his lead on lap three after he clipped the landing of a quadruple jump and overshot the following turn, leaving him briefly tangled in the safety net. Musquin assumed the lead position from there as he battled with a hard-charging Justin Hill for the top spot. Musquin ultimately went on to finish 2nd in the heat race, while Baggett fought his way back up to 7th to salvage a transfer position into the 450SX Main Event. In the Main Event, Musquin put himself into a favorable top-three position off the start, where he quickly set his sights on the lead spot. By lap three Musquin was able to pass Cooper Webb for the 2nd place position and he continued his momentum to pass Eli Tomac on the following lap. Musquin held the lead for 12 laps despite great pressure from Tomac in 2nd. Tomac eventually got around Musquin just after the halfway point but the French rider quickly rebutted with an impressive pass to regain the lead. The duo continued to put on an exciting battle for the fans but it was ultimately Tomac who prevailed, with Musquin finishing a close 2nd after 26 laps of racing. Tickle got a top-five start in 450SX Heat 2 but soon ran into an issue that dropped him back outside the top-ten. The race was unfortunately red flagged early on due to a downed rider, which resulted in a single file restart based on the current running order. Tickle capitalized on the opportunity to reposition himself as he climbed back into a top-five position after the restart. In the 450SX Main Event, Tickle began just outside the top-five aboard his KTM 450 SX-F FACTORY EDITION where he maintained a consistent performance throughout the entire race. Despite chaos around him, Tickle held strong to bring home his second top-five finish of the season at Round 8. It was a tough night for Rocky Mountain ATV*MC – WPS – KTM’s Blake Baggett, who finished 9th in the 450SX Main Event. After eight rounds Baggett still maintains the 3rd place position in the 450SX Championship Standings.